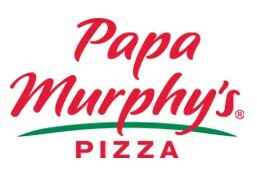 Papa Murphy's is currently closed for delivery and it will open at . 8 Pcs tender juicy cuts of 100% Chicken Breast, marinated in our signature spice blends and coated for an extra special experience. Oven Baked Wings marinated in our Signature Fire Starter blend. 8 Pieces Of Oven Baked Chicken Wings & 2 Dips. 4 Pieces Of Toasted French Bread With Garlic Butter And Herbs. A 10 inch pizza crust w/ herb garlic base and topped with cheese. Comes w/ a marinara dip. Served With 2 Pcs Garlic Toast. Traditional Pizza Sauce, 100% Whole - Milk Mozzarella, Mozzarella & Cheddar Mix (6 Slices). Traditional Pizza Sauce, 100% Whole - Milk Mozzarella, Mozzarella & Cheddar Mix (8 Slices). Traditional Pizza Sauce, 100% Whole - Milk Mozzarella, Mozzarella & Cheddar Mix (10 Slices). Signature Fire Starter Sauce, Fire Starter Marinated Grilled Chicken, Onion Mix, 100% Whole Milk Mozzarella Cheese, Mozzarella & Cheddar Cheese Mix, Green Onions. Traditional Pizza Sauce , 100% Whole-Milk Mozzarella, Pepperoni, Mozzarella & Cheddar Mix (6 Slices). Traditional Pizza Sauce , 100% Whole-Milk Mozzarella, Pepperoni, Mozzarella & Cheddar Mix (8 Slices). Traditional Pizza Sauce , 100% Whole-Milk Mozzarella, Pepperoni, Mozzarella & Cheddar Mix (10 Slices). Traditional Pizza Sauce, Smoked Turkey & Pineapple (6 Slices). Traditional Pizza Sauce, Smoked Turkey & Pineapple (8 Slices). Traditional Pizza Sauce, Smoked Turkey & Pineapple (10 Slices). Traditional Pizza Sauce, Pepperoni, Sausage, Ground Beef, Fresh Mushrooms, Onion Mix, Green Peppers & Black Olives (8 Slices). Traditional Pizza Sauce, Pepperoni, Sausage, Ground Beef, Fresh Mushrooms, Onion Mix, Green Peppers & Black Olives (10 Slices). Traditional Pizza Sauce, Pepperoni, Sausage, Fresh Mushrooms, Black Olives, Mozzarella & Cheddar Mix, Parmesan And Zesty Herbs (6 Slices). Traditional Pizza Sauce, Pepperoni, Sausage, Fresh Mushrooms, Black Olives, Mozzarella & Cheddar Mix, Parmesan And Zesty Herbs (8 Slices). Traditional Pizza Sauce, Pepperoni, Sausage, Fresh Mushrooms, Black Olives, Mozzarella & Cheddar Mix, Parmesan And Zesty Herbs (10 Slices). Traditional Pizza Sauce, Smoked Turkey, Pepperoni, Sausage, Salami & Ground Beef (6 Slices). Traditional Pizza Sauce, Smoked Turkey, Pepperoni, Sausage, Salami & Ground Beef (8 Slices). Traditional Pizza Sauce, Smoked Turkey, Pepperoni, Sausage, Salami, & Ground Beef (10 Slices). Traditional Pizza Sauce, Smoked Turkey, Pepperoni, Sausage, Salami & Ground Beef (10 Slices). Creamy Garlic Sauce, Chicken, Roma Tomatoes, Green Onions, Mozzarella & Cheddar Mix, Parmesan & Zesty Herbs (6 Slices). Creamy Garlic Sauce, Chicken, Roma Tomatoes, Green Onions, Mozzarella & Cheddar Mix, Parmesan & Zesty Herbs (8 Slices). Creamy Garlic Sauce, Chicken, Roma Tomatoes, Green Onions, Mozzarella & Cheddar Mix, Parmesan & Zesty Herbs (10 Slices). Creamy Garlic Sauce, Fresh Spinach Leaves, Zucchini, Fresh Mushrooms, Artichoke Hearts, Roma Tomatoes, Onion Mix, Mozzarella & Cheddar Mix, Parmesan & Zesty Herbs (6 Slices). Olive Oil Sauce, Garlic, Mozzarella, Fresh Spinach Leaves, Grilled Chicken, Sun-Dried Tomatoes, Feta Cheese & Zesty Herbs (8 Slices). Olive Oil Sauce, Garlic, Mozzarella, Fresh Spinach Leaves, Grilled Chicken, Sun-Dried Tomatoes, Feta Cheese & Zesty Herbs (10 Slices). Creamy Garlic Sauce, Grilled Chicken, Smoked Turkey, Artichoke Hearts, Fresh Spinach Leaves, Parmesan & Zesty Herbs (8 Slices). Creamy Garlic Sauce, Grilled Chicken, Smoked Turkey, Artichoke Hearts, Fresh Spinach Leaves, Parmesan & Zesty Herbs (10 Slices). Creamy Garlic Sauce, Fresh Spinach Leaves, Fresh Mushrooms, Roma Tomatoes, Mozarella & Cheddar Mix (8 Slices). Creamy Garlic Sauce, Fresh Spinach Leaves, Fresh Mushrooms, Roma Tomatoes, Mozarella & Cheddar Mix (10 Slices). Creamy Garlic Sauce, Pepperoni, Sausage, Fresh Mushrooms, Roma Tomatoes, Green Onions, Mozzarella & Cheddar Mix, Parmesan & Zesty Herbs (8 Slices). Creamy Garlic Sauce, Pepperoni, Sausage, Fresh Mushrooms, Roma Tomatoes, Green Onions, Mozzarella & Cheddar Mix, Parmesan & Zesty Herbs (10 Slices). Cheese Pizza On Our Original Crust With Your Choice Of Sauce & Toppings - 6 Slices. Baked & unbaked options available.